The Joemeek oneQ2 Master Studio Channel is a mic preamp and channel strip that contains a suite of professional studio tools in a single, 2U chasis. An updated version of the orignal oneQ, it offers improved audio specifications, routing options, and metering. The oneQ2 sports an optical compressor that includes Compress (threshold), Slope (ratio), Attack, Release, and Makeup Gain controls. The Comp Link button and it corresponding rear-panel jack make it possible to link up a second oneQ2 when recording stereo sources. The 4-band "Meequalizer" EQ can be switched in or out of the signal chain. The low-frequency and high frequency are each switchable between two center frequencies, and the low-mid and high-mid bands have sweepable frequency ranges. The front-panel Post EQ switch moves the compressor from before the EQ in the signal chain to after. The Enhancer section is designed to add clarity but not extra gain to the input signal. Controls include Effect, which sets amount of the Enhancer; Range, for setting the frequency above which the effect is applied; and Q, which adds a resonant peak at the Range frequency. Turn on the De-Esser effect to reduce sibalence in vocals. It lets you adjust the gain-reduction frequency; listen to the output of the sidechain filter, and adjust the threshold above which reduction is applied. 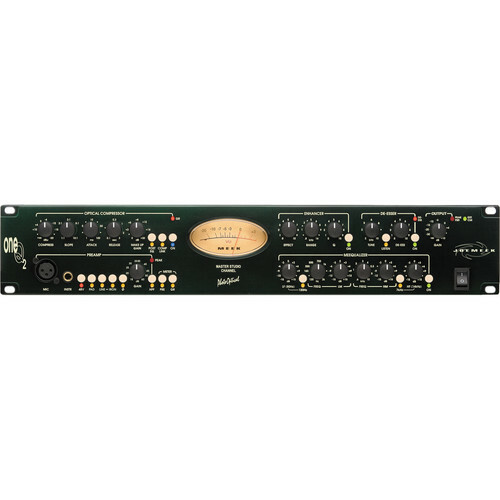 A large and accurate VU meter can be set to display output level, preamp level, or gain reduction. The oneQ2's outputs include XLR and 1/4" analog line outs, as well as AES/EBU, S/PDIF, and optical digital outputs. Wordclock input and output jacks on BNC connectors allow for synchronization with external clock sources or devices. IRON switch routes the line input through the transformer. Channel 2 Analog Input allows an external balanced analog audio signal to be fed to (the otherwise unused) digital channel 2. Box Dimensions (LxWxH) 24.2 x 10.8 x 5.3"
oneQ2 Master Studio Channel is rated 5.0 out of 5 by 1. Rated 5 out of 5 by Shutterbugman from Joe Meek OneQ2 I use this no more than an hour or 2 at a time for recording vocals and acoustic guitar.Sound quality and options are second to none.Gives you absolute control on every aspect of your vocals or acoustic sound.Huge difference between my recordings before and after using the Joe Meek.